Careen leads UNEP FI’s Positive Impact Initiative, which aims to catalyse the finance sector’s ability to finance sustainable development and the transition to a more inclusive and sustainable economy – as per the Sustainable Development Goals (SDGs) adopted in 2015. At the heart of the Initiative lie the Principles for Positive Impact Finance and the belief that impact that impact-based business and financing models will be key to addressing the SDG financing gap. This focus builds on close to 10 years at UNEP FI, during which Careen helped develop and expand the sustainable finance agenda in emerging markets, by supporting the development of strong in-country sustainable finance networks and the creation of a well-established training programme on environmental & social risk management. A strong believer in the need for simple communication tools for banking practitioners, Careen is also co-author of UNEP FI’s Guide to Banking & Sustainability. Liselotte joined UBS in 1997 and heads the firm’s Environmental and Social Risk (ESR) function since 2003. She acts as the ESR Underwriter of UBS and as the Secretary of the UBS Global ESR Committee, and is a member of the UBS and Society Operating Committee. She develops and implements principles and independent risk control frameworks for environmental and social (including human rights) risks within UBS Group. She developed UBS’s Climate Change Strategy established in 2006 and oversees its execution. She represents UBS in relevant organizations such as the UN Environment Program Finance Initiative (UNEP FI), acts as Sherpa of the WEF Alliance of CEO Climate Leaders and is a member of the advisory boards of the University of Zurich Competence Center for Human Rights (UZHR) and of the Swiss Center of Expertise in Human Rights (SCHR). Butch Bacani leads UN Environment’s Principles for Sustainable Insurance Initiative (PSI), the largest collaborative initiative between the UN and the insurance industry. Endorsed by the UN Secretary-General and insurance industry CEOs, the PSI serves as a global framework for the insurance industry to address environmental, social and governance issues as risk managers, insurers and investors—and a global initiative to strengthen the industry’s contribution to building resilient, inclusive and sustainable communities and economies. Developed by UN Environment’s Finance Initiative, the PSI was launched at the 2012 UN Conference on Sustainable Development. Butch leads PSI activities supporting global policy frameworks such as the UN Sustainable Development Goals, Paris Agreement on Climate Change, and Sendai Framework for Disaster Risk Reduction, as well as the Financial Stability Board’s climate risk disclosure recommendations. He forged the largest collaboration between the insurance industry and cities, wrote the Insurance Industry Development Goals for Cities, forged the PSI’s partnership with the world’s microinsurance community, and co-led the creation of UN Environment’s Sustainable Insurance Forum for regulators. Butch is involved in the UN Secretary-General’s Climate Resilience Initiative, G7 and G20-backed InsuResilience Global Partnership, and Vulnerable 20 Group of Ministers of Finance. Butch led the global research, consultation and drafting process that created the PSI in 2012, and UN Environment’s insurance and investment programmes from 2006 to 2010, including activities with the Principles for Responsible Investment. He has shaped global insurance industry commitments to address climate change, disaster risks, tobacco risks and illegal fishing; and to protect World Heritage Sites. Butch has authored or contributed to pioneering studies, including the first sustainable insurance study; first global sustainability survey of the insurance industry; first global insurance industry survey of cities, SMEs and climate risks; and a legal roadmap on fiduciary duty and responsible investment. Before the UN, he was in the insurance industry for over a decade, working with leading insurers and reinsurers worldwide. He reports directly to the Board of Directors. His mission is to ensure that people are systematically placed at the decision-making processes. This includes the entire value chain: from the design of customer solutions to marketing and sales, customer relations and complaints. Furthermore, he works to reinforce responsible business culture; social, environmental and reputational risks; integrated reporting and community investment. Former President of DIRSE, Spanish Association of CSR Professionals and Former President of SpainSIF, Spanish Forum for Socially Responsible Investment. Antoni holds a Degree in Business Sciences and MBA from ESADE Business School. He has studied at Harvard Business School and is First Mover Fellow at The Aspen Institute. Wiebke Bartz-Zuccala has been working as a Policy Analyst at the OECD since 2015 focusing on private sector financing for sustainable development. She covers topics as Social Impact Investment and Blended Finance. She holds a PhD from Frankfurt School of Finance & Management in small business economics and finance. She is a banker by training and has been working in a variety of positions also in development finance, for instance at the EBRD or BlueOrchard. Marc BICHLER is a lawyer by training and a diplomat by choice. He joined the Ministry of Foreign Affairs in Luxembourg in 1990 and has consecutively served as Deputy Director for Development Cooperation and Humanitarian Action (1995-2000), as Deputy Permanent Representative of Luxembourg to the United Nations in New York (2000-2005), then as Director for Development Cooperation and Humanitarian Action and Ambassador to Burkina Faso, Mali and Senegal with residence in Luxembourg (2005-2012). From November 2012 to April 2014, he was the Executive Secretary of the United Nations Capital Development Fund (UNCDF) in New York and is serving since August 2014 as Luxembourg’s Ambassador-at-Large for climate change. In his successive functions, Mr. BICHLER grew extensive expertise and experience in the field of sustainable development in general and of financing for sustainable development, including on innovative financing in the fields of microfinance, financial inclusion and climate finance, in particular. In October 2016, Mr. Bichler was appointed as Luxembourg’s Ambassador-at-Large for Human Rights. Marc BICHLER est juriste de formation et diplomate par choix. Il a rejoint le Ministère des Affaires étrangères du Luxembourg en 1990 et a occupé successivement les postes de Directeur adjoint de la Coopération au développement et de l’Action humanitaire (1995-2000), de Représentant permanent adjoint du Luxembourg auprès des Nations Unies à New York (2000-2005), puis de Directeur de la Coopération au développement et de l’Action humanitaire et d’Ambassadeur au Burkina Faso, au Mali et au Sénégal avec résidence à Luxembourg (2005-2012). De novembre 2012 à avril 2014 il a été le Secrétaire exécutif du United Nations Capital Development Fund (UNCDF / FENU) à New York et sert depuis août 2014 comme Ambassadeur itinérant pour le changement climatique du Luxembourg. Au fil de ses fonctions successives, M. BICHLER a acquis une vaste expertise et expérience en matière de développement durable en général et de financement du développement durable, y inclus les financements innovants en matière de microfinance, la finance inclusive et le financement de l’action climatique, en particulier. En octobre 2016, M. Bichler a été nommé comme Ambassadeur itinérant pour les droits de l’homme du Luxembourg. Director in charge of financial stability at the French Treasury since July 2017 and Vice-President of the Capital Markets Committee at the OECD. Previous roles include Head of Banking & Financial Sector Analysis & HCSF Secretary General at the French Treasury from 2011-2017 and alternate Director at the European Investment Bank. Richard Burrett is a Partner at Earth Capital Partners – a company specialising in providing advice on investments that address the challenges of sustainable development. He has spent over 30 years involved in international finance. In his 20 years with ABN AMRO he developed extensive experience of project and structured finance, particularly in the energy and infrastructure sectors. In the role of Global Head of Project Finance he was also instrumental in the creation of the Equator Principles, a market recognised standard for managing environmental and social risk issues in project financing. Latterly, as Global Head of Sustainability, he chaired the group’s Sustainability Council and developed the bank’s strategy on climate change and the carbon markets. Richard is a Fellow of the University of Cambridge Institute for Sustainability Leadership and Senior Adviser to the Earth Security Group. He is a FMO nominated non-Exec Board Director of Union Bank of Nigeria and has been Co-Chair of the UNEP Financial Initiative; He is also a Board Member of Forest Trends – a Washington based not for profit organisation focused on market-based approached to conservation. Denis Childs began his career at Société Générale in 1978 and spent his entire career in developing new areas of business. In 1981, he moved to Société Générale Corporate & Investment Banking to develop Export Credit Department as a leader of the industry. In 1993, he created the Commodity and Trade Finance worldwide Business line and further on Mining Oil and Gas and Power Project Finance were added to his responsibility. During that period, he created the “Global Commodity Fund” (“Debt Fund”) and “Agrofinanzas,” a “Sofol” in Mexico (“Farmer Financing”). End of 2008, he started a new challenge both heading the Emerging and Sustainable Development Department of the CIB. As a result he is now in charge of all CIB ‘Positive Impact Finance including Environmental and Social Advisory (Transactions & Clients). He is also member of the steering committee of the “Positive Impact Finance Initiative of UNEP-FI (United Nation Environmental Program Financial Initiative). – Impact based finance to the UN Sustainable Development Goals in such areas as Smart Cities, Energy Efficiency,, Mobility , Food Security, Healthcare and Social inclusion and. On January 2015 Denis CHILDS joined the Board of the UNEP-FI Banking Commission. Paul is Alternative Distribution Manager for HSB Engineering Insurance (part of Munich Re) responsible for the development of product and service offerings with particular emphasis on green energy risks. Paul joined HSB Engineering Insurance in 2004 undertaking roles in business development and major risk underwriting and was promoted to his current role as Alternative Distribution Manager in 2017. Prior to joining HSB, Paul held various roles within sales, underwriting and marketing for National Vulcan and RSA Engineering. Paul has over 25 years’ experience in the engineering insurance market and holds a DipCII from the Chartered Insurance Institute. His knowledge and expertise on insurance as a catalyst for energy efficiency investment has seen him present at a number of forums, including most recently the United Nations Environment Programme Finance Initiative. Maria Anne van Dijk is responsible for ABN AMRO’s sustainability risk policy and monitoring compliance of this policy by the bank. The policy describes the social and environmental requirements that ABN AMRO’s clients, in particular corporate clients, need to meet. She is also responsible for the bank’s human rights programme, one of the mainstays of ABN AMRO’s sustainability policy. Maria Anne is convinced that companies and banks should – and can – help solve the problems society faces today, such as human trafficking and modern slavery. And that partnerships with other parties have a key role to play here. Maria Anne van Dijk has worked in various roles in the financial services industry for over 25 years, focusing specifically on sustainability since 2003. She labels herself as a ‘corporate activist’ and gave a TEDx Talk about what drives her in this role in November 2016. Sabine Döbeli is the CEO of Swiss Sustainable Finance, an association that was founded in 2014 with the objective of promoting sustainability in Swiss finance. Previously, she was Head of Corporate Sustainability Management at Vontobel. At Zürcher Kantonalbank she built up the sustainability research unit within the financial analysis department and was involved in the launch of various sustainable investment products. Sabine holds a Masters in Environmental Sciences from the Swiss Federal Institute of Technology (ETH) Zurich and a post-graduate degree in business administration from the University of Basel. Mr. Christopher Flensborg joined SEB in 2003 and is Head of Climate & Sustainable Financial Solutions. As a pioneer in Green Bonds, working closely together with The World Bank, he has developed concepts and mechanisms enabling mainstream investors to address climate investments in their portfolios. As a thought leader, SEB works to enable access for mainstream investor’s core portfolios to green investments. SEB´s goal is to be a prime provider of mainstream financial climate solutions across various financial mandates. In this capacity, Mr. Flensborg has been and is involved in climate investment strategies worldwide, from development to execution – from borrowers to investors. Mr. Flensborg spent over 28 years working in leading international financial institutions. He received his management training from international banks through schooling at Oxford, INSEAD, and Harvard. Mr. Flensborg has received a number of awards for his work. In 2017 he was named “Personality of The Year” by Environmental Finance magazine. Bertrand joined Lombard Odier in 2011 as Head of Impact Investing and SRI. He started his career in Singapore in the Investment Banking arm of BNP Paribas in 1997, before joining the Wealth Management business line in Paris in 2001, where he took the lead on several international projects related to e-banking and marketing. In 2003, Bertrand moved to Geneva and in 2006 he created the Responsible Investments and Philanthropy offering of the French bank. Acting as the Global Head of this team, Bertrand implemented a complete range of SRI and Impact Investment solutions for BNP Paribas’ HNW clients. He also contributed to defining and setting up the bank’s philanthropic services, providing support and advice to clients throughout their philanthropic journey. In addition to his professional responsibilities at Lombard Odier, Bertrand was President of Sustainable Finance Geneva, a non-profit organization active in the promotion of responsible finance in Switzerland. Bertrand is also the founder and president of Association Tizayuca, an NGO working with underprivileged children in Mexico. Bertrand has a Master’s degree in International Finance from Skema Business School in France. On 1 April 2015, United Nations Secretary-General Ban Ki-moon appointed Elliott Harris as Assistant Secretary-General and Head of the New York Office of the United Nations Environment Programme (UNEP).Mr. Harris joined UNEP as Director of the New York Office and of the Secretariat of the Environment Management Group (EMG) in September 2013. Prior to joining UNEP, he worked as an Economist in the IMF from 1988 to 2013, gaining extensive policy and programmatic experience in African and Central Asian countries, as well as in the Fiscal Affairs Department on public expenditure policy issues. From July 2002 onward, Mr. Harris served as Advisor and Assistant Director in the IMF’s Strategy, Policy and Review Department, including as Chief of the Development Issues Division. From September 2008 until May 2012, he was also the IMF’s Special Representative to the United Nations, and was closely involved in interagency collaboration in the areas of social protection, the green economy, and fiscal space for social policy. From September 2009 until October 2013, he was the Vice Chair of the High-Level Committee on Programs (HLCP) of the UN Chief Executives Board for Coordination. Denise has 28 years of experience in the financial market, more specifically on investment, financial planning, wealth management and innovation. She is the head of the Sustainability and Inclusive Business, which includes Microcredit and Women Entrepreneurs programs, at Itaú Unibanco. She is president of the Brazilian Global Compact Netwok and co-chair of the Steering Committee’s United Nations Environment Programme – Finance Initiative. Also part of the Brazilian Business Council for Sustainable Development and Member of the Sustainability Commission of Brazilian Federation of Banks. Sabina Timco Iacazzi is leading the human rights and social issues activities at UNEP Finance Initiative since 2013. Sabina has more than ten years of experience working on sustainable business development and human rights issues with the United Nations and civil society. Other than UNEP FI, where she was also the European region coordinator between 2012 and 2015, she worked on technical assistance implementation, policy development and stakeholder engagement at the International Trade Centre, the United Nations Children’s Fund and the Geneva-based International Film Festival and Forum on Human Rights. Sabina holds a Post-graduate degree in international law from University of Paris 1 Panthéon-Sorbonne. Georg Kell is Chairman of the Board at Arabesque Asset Management Ltd, an Anglo-German asset management firm and the world’s first ESG quant fund, combining sustainability priorities with quantitative analysis. He was the founding Executive Director of the United Nations Global Compact, the world’s largest voluntary corporate sustainability initiative with over 8,000 corporate signatories from more than 160 countries. Through his leadership, Kell helped to establish the Global Compact as the foremost platform for the development, implementation and disclosure of responsible and sustainable corporate policies and practices. In a career of more than 25 years at the United Nations, Mr. Kell also oversaw the conception and launch of the Global Compact’s sister initiatives on investment, the Principles for Responsible Investment (PRI), and on education, the Principles for Responsible Management Education (PRME), together with the Sustainable Stock Exchanges (SSE) initiative. Liliana de Sá Kirchknopf’s role at SECO involves promoting a better business environment and access to finance for enterprises as well as strengthened skills. She has been working for SECO since 1996 in different positions, including as Senior Advisor at the Swiss Executive Directors Office at the World Bank Group in Washington D.C., as private sector development specialist for the International Finance Corporation IFC and as Head of the Swiss Contribution Office in Budapest, responsible for the set-up and implementation of a CHF130 million cohesion programme in Hungary. She holds a masters in economics from the University of Berne with a minor in political science. She speaks five languages. Richard is an expert in sustainable finance and over the last 16 years he has advised various UN bodies, governments, financial intuitions, companies and NGOs on how to integrate climate change and natural capital analysis into their decision making. He has led numerous ground-breaking projects including leading the first global assessment of corporate environmental externalities for the UN-backed Principles for Responsible Investment and UNEP FI. 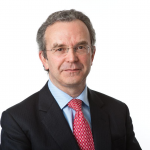 Richard is a member of the EU Sustainable Finance High Level Expert Group and the Global Advisory Council of the Oxford Smith School Stranded Assets Programme. Previously, Richard was a strategy consultant and began his career as a neuroscientist. Dan is the new Programme Director of the Corporate Human Rights Benchmark (CHRB). 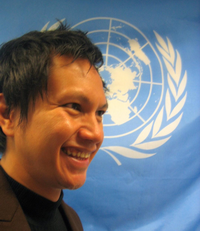 Previously he worked as a social-performance consultant, largely with the extractives and renewables industries. He focused on improving company systems and performance; social and human rights risk and impact management; security and human rights; socio-economic development and grievance management. Dan will be refining the CHRB methodology, expanding it to new companies and industries in the future and is keen to engage with interested parties and investors wanting to better understand company human rights performance. David Pitt-Watson has been involved with UNEP FI for many years, and became its Co-Chair in 2013.He is recognized globally as a leading thinker and practitioner in the field of responsible investment and business practice. As co-founder, and former CEO of the Focus Funds and Equity Ownership Service, he built and led the largest responsible investment group of any institutional fund manager in the world. He is a board member of the International Corporate Governance Network, and was closely involved in the setting up of the UN’s Principles for Responsible Investment. He has been involved in policy making in the UK, Europe and around the world, particularly in the field of corporate governance and financial market regulation, and has written extensively on these subjects. Fiona joined the PRI in 2013. She has overall responsibility for the PRI’s operations globally. Fiona has more than 20 years’ experience in the pension sector, working in particular with the Australian government, and has played a key role in advocating pension policy change on behalf of working Australians. Fiona has a particular interest in retirement outcomes for women. Prior to joining the PRI, Fiona spent seven years as Chief Executive Officer at the Australian Institute of Superannuation Trustees (AIST). Fiona has formerly been a director of AUSfund, Industry Funds Credit Control, Australia for UNHCR and the National Network of Women in Super. In September 2012, she was named by the Australian Financial Review as one of Australia’s top 100 women of influence for her work in public policy. Fiona also serves on the Councils of the International Integrated Reporting Council (IIRC), Tomorrow’s Company, the Global Advisory Council on Stranded Assets at Oxford University and the Business for Peace Steering Committee. 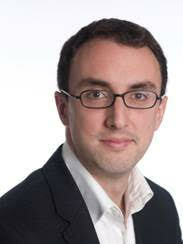 Nick Robins has over 20 years experience in the policy, research and financial dimensions of sustainable development. He was formerly the Head of HSBC’s Climate Change Centre of Excellence in London, where his research included annual reports on the bonds and climate change arena, evaluation of the potential risks of stranded assets from carbon constraints, an estimate of the growth prospects of the global low-carbon economy and an analysis of international ‘green stimulus’ programmes. The Thomson Extel awards for European investment research ranked Nick as the top analyst for integrated climate change in 2009, 2011, 2012 and 2013. Before joining HSBC, Nick was first head of SRI research, and then head of SRI funds (UKP1bn+) at Henderson Global Investors where he produced the first carbon audit of an investment fund and helped launch the Industries of the Future portfolio. He was previously Director of Sustainable Markets at the International Institute of Environment and Development, and worked at the European Commission’s Environment Directorate and was part of the original Business Council for Sustainable Development working on the Changing Course book for the 1992 Earth Summit. Externally, Nick is an observer on the European Commission’s High-Level Expert Group on sustainable finance. Olivier Rousseau was appointed as a member of the management Board of the French Pension Reserve Fund (FRR) in November 2011. FRR is a pension buffer fund with 35 B€ in assets. The Board comprises of a non-executive chairman and two full time executive members. Olivier Rousseau also chairs the asset manager selection committee. After graduating from the French National School of Administration (ENA) in 1986 he joined the French Treasury in Paris. He worked 11 years for BNP Paribas in international banking and finance in Paris, London, Singapore, Hong Kong and Sydney. 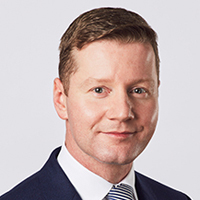 His postings spanned asset swap portfolio management in Tokyo, head of fixed income origination for French issuers, head of corporate and institutional banking at BNP London, chairman of the management committee of BNP Prime Peregrine, group managing director of BNP Paribas equities Australia. He also served on the resident Board of directors of the European Bank for Reconstruction and Development in London (2004-2006) and as regional economic counsellor at the French embassy in Stockholm (2006-2011). Lucia Rückner is Senior Consultant for Corporate Responsibility in Business at the Corporate Responsibility Department of Munich Re Group. She is member of the board of the PSI Initiative of the UNEP FI and in this role responsible for Social Issues. In her previous positions at Munich Re she worked as Risk Manager, Economic Researcher and Underwriter of Casualty Business. Lucia holds a degree in Mathematics. Guido Schmidt-Traub is Executive Director of the UN Sustainable Development Solutions Network. After graduating from Tokyo University, Takejiro Sueyoshi joined the Mitsubishi Bank (the Bank of Tokyo-Mitsubishi UFJ) in 1967 and worked for the bank until 1998. He is Special Advisor to UNEP FI in the Asia Pacific region. During his years with Nikko Asset Management as Deputy President, he was appointed as a member of the UNEP FI Steering Committee. In addition to the involvement in the UNEP FI activities, he is giving many educational speeches about environmental problems and CSR/SRI in various government councils, seminars, universities and schools. He was a member of the Council for Japan`s Prime Ministers (Mr. Fukuda and Mr. Aso) on Climate Change Policy. Christian Thimann is AXA’s Head of Regulation, Sustainability & Insurance Foresight, overseeing the group’s regulatory and public affairs positioning, its engagement on corporate responsibility and sustainability, and its work on foresight as well as the AXA Research Fund. From 2014-16 he was overseeing the Group’s strategy function. He is also Vice-Chair of the FSB’s Task Force on Climate-related Financial Disclosures, Co-Chair of the UNEP Finance Initiative Global Steering Committee (UNEP FI) and Member of the OECD Advisory Board. He has been recently appointed Chairman of the High-level Expert Group on Sustainable Finance. Moreover, he is a professor at the Paris School of Economics, and a member of the French Prime Minister’s Council of Economic Advisors. Mr. Thimann was previously Director-General and Adviser to the President at the European Central Bank in Frankfurt. Before joining the ECB, Mr. Thimann worked for the IMF. Mr. Thimann holds a Ph.D. in economics from Munich University and a M.Sc. from the London School of Economics. He has written extensively on insurance, international finance and European integration. Jakob Thomae is Director of 2° Investing Initiative Germany. He helped co-found the 2° Investing network in New York and Berlin and manages the think tank’s research on 2°C scenario analysis for banks, institutional investors, and companies. Jakob led the development of the first 2°C scenario analysis tool for equity and credit portfolios, now applied by over 200 financial institutions worldwide. Jakob also leads the organization’s partnerships with financial supervisors and governments in Europe, including in Switzerland and the Netherlands. Eric Usher currently heads the UN Environment Programme Finance Initiative, UNEP FI, a global partnership bringing together the UN with 230 banks, insurers and asset managers working to develop the sustainable finance and responsible investment agendas. Eric oversees governance, strategy and day-to-day management of UNEP FI’s work programme and global network development. Over the years UNEP FI has established some of the most important sustainability oriented frameworks within the finance industry, including the Principles for Responsible Investment (2006), the Principles for Sustainable Insurance (2012) and work now underway on the establishment of Principles for Responsible Banking. Since joining in 2015, Mr. Usher has focused on accelerating the deep integration of sustainability risks into financial practice, including addressing climate change, natural capital loss and human rights abuses, as well as building out the frameworks for positive impact finance needed to achieve the UN Sustainable Development Goals. Eric sits on several industry bodies including as UN representative on the Board of the Principles for Responsible Investment, as a member of the Evaluation Council of the French sovereign green bond, as Director for the impact fund REPP Africa and founder of the Seed Capital Assistance Facility. Prior to leading UNEP FI, Mr. Usher has over twenty years of experience in the low carbon sectors, spanning technology commercialisation in Canada, solar rural electrification in Morocco and financial sector development across emerging markets. During 2011, Mr. Usher worked on the establishment of the Green Climate Fund and led efforts to create its Private Sector Facility. Eric has been an editor of the Global Trends in Renewable Energy Investment report published annually with Bloomberg and was lead author for finance of the IPCC Special Report on Renewable Energy Sources. Before joining the UN, Eric was General Manager of a solar rural electrification company based in Morocco. James is a specialist in social and environmental finance having been at Triodos Bank since 1998. James has advised on bond issues and share offers for leading social enterprises and charities. He has managed equity investments in a range of early stage businesses in the organic food, recycling and environmental technology sectors. In 2005, James started Triodos Bank’s investment activity in the UK and was Managing Director of Investment Management, incorporating corporate finance advisory services and fund management. James was also the Managing Director of Triodos Renewables plc from 2005-2012. He has been a director of many green and sustainable businesses and has served on the board of UKSIF and was treasurer of a local community development association. James was a member of the Investment & Contract Readiness Fund Advisory Panel and the UK Advisory Board to the G8 Social Investment Taskforce. He now leads the development of strategy across the Triodos Bank group internationally. Willemijn has more than 10 years of experience in the international climate finance policy and investment field. Since 2015 she leads the work on integrating climate risks into investment decision making & climate change corporate and regulatory engagement at MN, The Netherland’s third largest pension asset manager. Before joining MN she was lead NL climate finance negotiator to the UNFCCC and senior private climate finance expert for the Dutch government (Treasury & Foreign Office). She studied economics the University of Utrecht and London School of Economics. Philip Walker is a Managing Director Africa, and member of the Executive Committee of Obviam. Obviam is an impact investment advisor that makes long-term investments in unlisted and fast growing SMEs in emerging and frontier markets via private equity funds. Philip is responsible for new private equity fund investments, and for managing a portfolio of fund investments in Africa. He has invested across impact sectors in Africa, from healthcare to renewable energy, to sustainable forestry on behalf of clients that include Switzerland’s Development Finance Institution (SIFEM), UBS, Credit Suisse, foundations and HNWIs. Prior to Obviam, Philip worked at the United National Environment Programme Finance Initiative where he was a member of the team that developed and launched the Principles for Responsible Investment. Philip holds an M.Sc. Finance from London Business School. Jane’s professional experience spans 25 years, mostly in Luxembourg, where she has “grown up” with the investment management and financial sectors. Over the last decade her particular focus has been on sustainable finance. At the Luxembourg Stock Exchange, Jane is leading and managing the company’s developments in sustainable finance, including the Luxembourg Green Exchange. She is a regular contributor to and member of a number of national and international sustainability-focused working groups including Luxembourg’s Climate Finance Task Force; she has chaired the Luxembourg fund association’s Responsible Investing Market Intelligence working group. Previously, Jane was a KPMG partner. She built KPMG Luxembourg’s Sustainability Services team responsible for sustainability client engagements and led KPMG’s internal CSR programme. She was also responsible for audits and reporting to boards and audit committees of a number of international groups with Luxembourg investment vehicles. Jane is a board member of Friendship, an award winning international NGO working to create lasting solutions to the challenges faced by the poor and marginalised communities in Bangladesh. Angela de Wolff, partner Conser Invest, has been active in the financial sector since 22 years, with a focus on Responsible Investment (RI). Among others she has been leading the sustainability team at Lombard Odier bank. Angela is co-founder of Sustainable Finance Geneva. She is on the Board of “Banque Cantonale de Genève” (BCGE) and the Swiss Investment Fund (SIFEM). She is also Vice-President of the platform « Swiss Sustainable Finance ».